Controls home automation functions, garage doors, alarm panels, etc., from up to 500ft (150m). 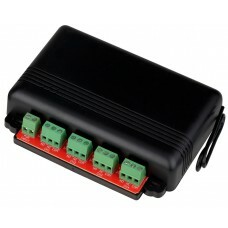 * Similar to SK-910RBQ, SK-910RB2Q & SK-910R4Q except with 4 outputs, independently programmable. Compatible with all 315MHz ENFORCER transmitters. Mode switch for easy programming. 4 LEDs, one per channel, indicate RF reception, learn mode, transmitter cleared, output type.